[가십걸] 손님들이 도착하면 가십거리를 한 상 내줄게. Concierge The Palace Hotel Lobby. 펠리스 호텔 로비입니다. 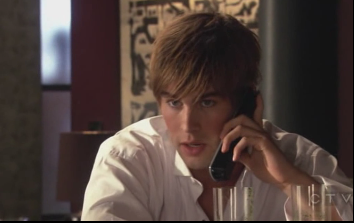 Nate Hi, this is Nate Archibald, calling from the Bass suite. but can you tell me what room the van der woodsens are in, please? 네, 배스 스위트 룸에 묵고 있는 네이트 아치볼든데요. 반 더 우드슨 가족이 묵고 있는 방 좀 알려주실래요? *Allow to be known, declare publicly, as in They gave out that she was ill.
/ cf.) Send forth, emit, as in The machine gave out a steady buzzing. / Distribute, as in They gave out surplus food every week. gave out suddenly, or My strength simply gave out. Serena Hey, Blair, it's me. Eh, I guess you're still sleeping but I'm gonna come over. I think we need to talk. Ok, ehm, see you soon. Bye. 안녕, 블레어, 나야. 아직 자고 있나 본데 내가 거기로 갈게. 얘기 좀 해야할 것 같아서. 그래, 이따 보자. 끊어. 한 상 내줄게. 메뉴 판은 여기 있어. *To talk idly, especially to gossip. * on the menu 메뉴에 올라; 계획[예정]에 들어./ What's on the menu? 메뉴에는 무엇이 있습니까?/ Here are your menus, and I'll be back in a few minutes to take your order. 메뉴판은 여기 있습니다. 몇 분 뒤에 주문을 받으러 다시 오겠습니다. Serena Mom, did you borrow my Michelle Perry’s? Uh, I can't find anything in here! 엄마, 내 미쉘페리스 빌려 갔어? 여기선 못 찾겠어! it's your life, you should start living it. because you decided you didn't like the colour of the walls in our real home. 엄마가 우리 진짜 집 벽지 색깔이 맘에 안 든다고 묵는 거잖아. Serena Mom, I said I'd go to this brunch. What do you want from me? 엄마, 브런치에 간다고 했잖아요. 나한테 뭘 더 바래요? Lily Serena, why are you being like this? You love parties. This is just not like you. 세레나, 네가 왜 이 모양이니? 너 파티 좋아하잖아. 이건 너답지 않아. Serena Maybe it is like me. Maybe you don't know what I'm really like. 아마 이게 나다운 것 일수도 있죠. 엄마가 내 진짜 모습을 모를 수도 있는 거고. Lily Oh, ok, tell me. 좋아, 말 해봐. Lily So did you and Dan have fun at the concert last night? Serena We, uhm, never made it. We actually ended up at the 'Kiss On The Lips' party. 못 갔어. 사실 ‘키스 온 더 립스’ 파티에 가게 됐어. graduation? or We finally made it to <?xml:namespace prefix = st1 />Chicago. don't know how Nancy will end up. Lily Ah, well that must have pleased Blair. Serena Blair? Actually no, not that pleased. Which is why I'm going to talk to her. 블레어? 사실 아니, 그렇게 좋아하지 않던데. 그래서 걔한테 가서 얘기하려는 거야. Lily Just be back in time for brunch, ok? 브런치 시간에는 맞춰서 돌아와야 한다, 알았지? 사람들이 네가 뭘 숨기려 한다고 생각할 거야. *She used to hide away in her room when she got depressed. Serena Coming from someone who's keeping my brother in an institution. 내 동생을 시설에 숨겨 놓으신 분이 말씀은 잘 하네요. *An opinion comes from a person. *A place for the care of persons who are destitute, disabled, or mentally ill.
Lily That's different. I mean it: Don't be late! 그건 달라. 농담 아니다, 늦지 마라! * I mean it[or that, what I say]. / I mean business. or I am serious. 진짜야, 농담이 아냐.